"Outside of these walls, there are no guarantees." Another outstanding short film to watch. 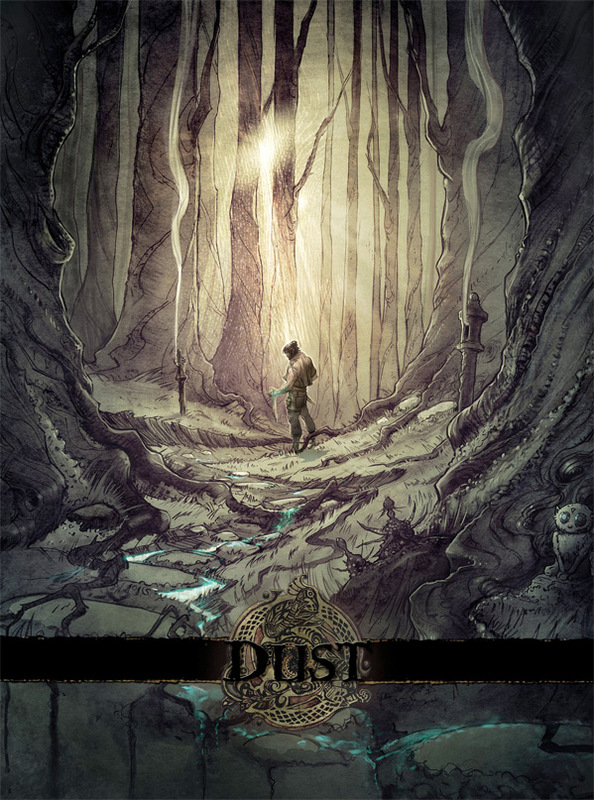 Dust is a sci-fi, fantasy short film produced by Ember Labs and directed by Mike Grier. We originally featured the teaser trailer for this short film way back in 2013, a year after it was on Kickstarter getting funding. Now it's finally complete and it's gorgeous, some of the best short film cinematography I've seen all year (by Michael Nie), with some incredible world-building and mythology to draw you deeper into the story. This was shot on location in remote areas of Japan with VFX added later. The film follows a tracker who takes a black-market merchant out into the wilderness to find the source of the "dust" that is poisoning the air. There's all kinds of cool flora and fauna hidden throughout this, and the main character (named Irezumi) is awesome. Enjoy. Produced by Ember Lab and filmed in remote areas of Japan, Dust takes place in a world of rapid evolution. Each year new species and adaptations alter the balance of their ecosystems. Technology and deep tradition exist as symbiotic opposites dividing people who live in the countryside from those who live in walled cities. From Vimeo: "Dust is set in a harsh and unpredictable natural environment where people have isolated themselves in an ancient city behind a massive wall. A socially marginalized tracker teams up with a black-market merchant to save the society that has rejected his way of life." The film is directed by Mike Grier, starring Mashasi Odate and Michael Evans Lopez; with music by Theophany (aka Jason Gallaty). For more info on the film and Ember Lab, visit their official website here. For more shorts, click here. Thoughts? I don't know what to think... Lot of amazing shots, great vfx, but horrible pacing and storytelling. These guys need a good screenwriter, and a better casting. Great poster though. I feel like this is the case with many of these sci-fi short films, I haven't seen this one yet though. I know. these guys are more focused on selling their technical skills to studios than in telling a compelling story. Visually amazing. Thanks for sharing this Alex.